← IS A HUMBLE MAN A WEAK MAN? H ave you ever been falsely accused or so badly hurt that you wanted to take revenge? In this life, we may face many injustices: we may be misunderstood; we may not be appreciated by others; our work and service may not be duly rewarded; we may be overlooked and ignored. Justice is a major theme in the book of Psalms. Justice is more than honesty. It is active intervention on behalf of the helpless, especially the poor. The psalmists praise God because He is just. 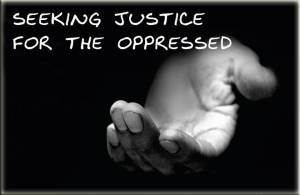 They plead for Him to intervene and bring justice where there is oppression and wickedness. They condemn the wicked who trust in their wealth and extol the righteous who are just towards their neighbors. The psalmists do not merely wish the poor could be given what they need, but plead with God to destroy those nations that are subverting justice and oppressing God’s people. This post is a great reminder to leave justice and revenge to God. Rest assured that God’s people will be avenged with righteous justice, not as mankind seeks to impart. So true but very difficult in the midst of suffering. The flesh wants to see justice done and if it is not then Faith can easily become weak, thinking God has turned from us letting the oppressor off the hook. Self blame can then become the dominant mind set, hindering prayer and having a devastating effect on our relationship with Jesus thinking we must have ‘got what we deserved’ and God only loves like a man does. This happened to me but the Lord in His mercy has given an abundance of Grace to help me through, even when I thought wrongly of Him. I did not want to take revenge on my ex husband by my own doing (when seeking revenge, remember and dig two graves, this is not Scripture but true) but I did want God to do justice on my behalf, in fact I wanted to hear of it, know that God had done something to this man for the evil he done to me, I desperately needed Gods intervention…. this I realise now is no different from seeking revenge, the only difference is I am asking God to do it for me. Reading aloud and proclaiming Gods promises of justice from the Psalms left me feeling empty for there was no way of knowing if the Lord was acting for me. I was well aware that God had seen what had been done (Psalm 109:1-5) but was He doing something about it? This terrible unhealthy attitude lasted a long time. Even though I knew that forgiving is what the Lord requires of me, in fact it is a Christian duty but I floated in and out of the two conflicting feelings because I was hurting so badly. I still do not know if the Lord ever ‘done’ anything to that man, all I know now is what God done for me. I did not have internet and avoided it since my ex loved to promote himself. The fear of discovering how well he was doing made me feel sick to the very depths of my being. I could not shift this gut retching consuming fear even though I deliberately prayed “Father forgive him” and knowing after I prayed that, that God may very well bless him more than me. However I prayed it all the more and reminded myself that a Christian does not get a pat on the back from God for forgiving, I reminded myself Jesus forgave me, I received mercy and I must now let go and release this man from the wrongs he done to me. I was also suffering post traumatic stress and was very ill, this was a massive hindrance making me inconsistent to what I prayed and what I truly felt. During this time, while nursing my Mother who had cancer I received a phone message from a family member who decided to tell me what they thought of me (they hated my Jesus thing) not nice but I could cope with that, we do not war against flesh and blood. My Mother was dying and the enemy wanted me as the only believer out of the way. I was not budging from my Mothers side. Another message came shortly after to tell me my ex had remarried. This the enemy hoped would be the final blow that would crack me, to be honest it was the news that I expected to finish me. But what happened next was beyond my human ability. After the initial shock peace came, the release that I had sought for 4 years, the very news that I dreaded hearing happened to be the thing that the Lord used to free me. Peace came, blessed peace and freedom straight from the Throne of Grace, I was thanking the Lord and in complete awe of what had taken place. Release, freedom what was impossible for me to do or achieve no matter how much I prayed, proclaimed or pleaded had now happened in an instant, in Gods perfect timing and through the news I thought would drown me. God brought justice but not how I thought He would, the justice He brought was healing, deliverance and renewal of strength for the oppressed…. me! Withheld, I truly appreciate your very honest and humble response to Pastor Joe Quatrone, Jr.’s awesome post. It touched me as well. God does not think on our level, nor does He act the way we think He should act. We must strive to let go of thoughts of revenge for we all stumble in many ways. This is not to say that abusers are let “off the hook,” for everyone must give an account of our words, thoughts and deeds. It is most beneficial for our sakes to give our hurts over to God’s care. I understand the flesh gets in the way, and I have struggled with injustice all of my life. No matter where is comes from, I always feel that I wish I could do something about it, especially when injustice becomes personal. I really love your response for so many reasons. But rest assured that we all, abusers included cannot escape the Divine order of life. Stay strong in the Lord always, no matter what. Withheld, allow me to also state this fact. Just because an abuser gets a new love and perhaps marries does not mean that he will stop abusing. It is just a matter of time before the newness wears off and his true colors show forth. From personal experience, I have known abusers who abused the new women in their lives. It is very rare that abusers change. Focus on your life and your relationship with Christ. We may think that our perspective paints a pretty picture, from the outside looking in – but rest assured that all is not well and in time it will show. You may never hear about it, but know that justice will come on both sides. Thank you for your encouraging response, I am truly grateful. I feel I must apologise because I did not begin my comment with thanks for Pastor Quatrone’s post. No excuses, I just sprang into action and off loaded, that being all about myself! I feel quite ashamed but can only hope that someone somewhere will find in the comment hope, finding rest in the knowledge that the battle is Gods (Exodus 14-14) and not ours, also victory comes only in Gods timing (Psalm 46:5) and He will do it His way. What troubles me is when I was looking for Christian web sites regarding abuse, I read that some women NEVER RECOVER. This has stuck with me. That is why I am so thankful myself and others have found your web site with the Spiritual kick that is needed by both believer and unbeliever. You Shall Know The Truth And The Truth Shall Make You Free, (John 8:32) Truth is not always easy to accept and can be a hindrance to recovery when it is rejected but God is a Faithful God, a God who will wait, that He may be Gracious to you. (Isaiah 30:18) I make mention of this because on a personal level I came to realise that idolatry can become a huge, yet hidden heart issue with those who must constantly seek someone’s approval . I hope that makes sense, I realised through the process of recovery, with shock and horror that I had fallen into that trap, even though I was seeking the Lord, praying and living as Godly a life I could under the circumstances. Recovery is a process and I have been ignorant and impatient but I thank Jesus for His patience, for understanding and knowing me better than I know myself, and for His gentleness. As King David says in Psalm 18:35 “Your gentleness has made me great”. Isn’t that a beautiful word, Gentleness!!! AND from The Son of God, how wonderful. Thank you to Pastor Quatrone’s for his compassionate post, but very sadly, yes, somewhere, someone is still in the midst of injustice and for someone else it is only beginning. I thank God for your diligent study of the Bible and pray that many ‘stumble’ upon this site, one way or another may the Lord Jesus Christ be given the chance to show Himself Mighty on their behalf, prepare their hearts. “Jesus is returning” – Yes He Is! There is no need for you to apologize. You have endured and overcame a traumatic situation, and most likely been silent for too long. You have a lot on your mind to share, and you have found a safe place to do so. Please keep speaking out. Someone somewhere needs to hear what you have to say, especially the people of God. Recovery is often difficult, but it is possible – provided that one desires to recover from abuse. Physical recovery is an enormous task for many reasons, especially if there are permanent reminders such as loss of sight or limb. Triggers and reminders will always be with us, but it is up to each individual to find the strength and fortitude to rise up from the pit of despair. Is this easy, no! Can we do this alone? No! Will God help us? YES!!! Now, are there exceptions? – possibly. There are people who are not in their “right mind,” and they may not recover from all sorts of trauma. Counseling and often medication such as anti-depressants may be needed. Each individual is different. It is not just the body that was violated, but mind and spirit. And no one knows what an individual spirit needs to heal, only the Spirit of God. Many “spiritual” people believe that meditation, self-improvement, chanting and the like is the way to spiritual growth. Unfortunately, without the connection and relationship with our Creator and our Savior, there is no real spirituality; no spiritual growth and no true peace within. Yes, “recovery is a process.” In the meantime, don’t be so hard on yourself. This is what kept you in abuse in the first place – blaming yourself. Give yourself credit for getting out and moving on with the help of our Lord. You are on the right path, love yourself. You are welcome here any time. Thank you! God will indeed hold the unrepentantchild abuser 100% accountible – especially thoes who claim to be christians and totally lie about what they have done- their pride will kill them in the end.God hates the evil of oppression and child abuse- these folks who refuse to be honest and repent will go to hell for sure- EVERYONE STOP making excuses for these folks- they deliberately chose to harm children – they made that choice- and had other options presented to thier souls but they loved to harm- and they are in deep trouble spiritually- help the victims by validating them- not to tell them to jump over this step into making a million excuses for the abuser. Is abuse evil yes- are folks who abuse evil yes…my mother is one of these…and she is evil…my father the same..they did not have to harm – they could have called on Jesus but indstead they delighted in inflicting pain and terror- they will have to answer to God-. Also when that day comes Jesus will have His loving arm around each one of us as He confronts the abusers- and will validate us and vindicate us completely and healus and send these evil vessels where they belong. I can certainly relate to your feelings and point of view. When our Lord returns, He will bring His righteous Justice with Him. Many do not believe this, or believe in God and judgment and that is very sad indeed.